So it comes as a surprise that on a number of occasions, Maxis recruited outside talent to make Sim games. 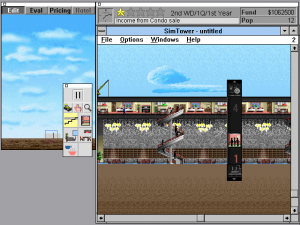 And even more shockingly, one of these projects, SimTower: The Vertical Empire, is intimate enough to stand equal to – if not a head above – all the others. It’s the tired-and-true Sim formula with the requisite substitutions and twists. You start out adding restaurants, condos, and office spaces, eventually expanding further into residential or commercial life. Should you use valuable space underground for a recycling center or a train station? Do you invest in apartment complexes or hotel rooms? New paychecks come every week, and if your real estate isn’t paying itself off, you can always rebuild (at great expense). Everything needs to be placed in a keen balance at the risk of stopping growth. If you’ve ever played a Sim game, this is familiar territory. 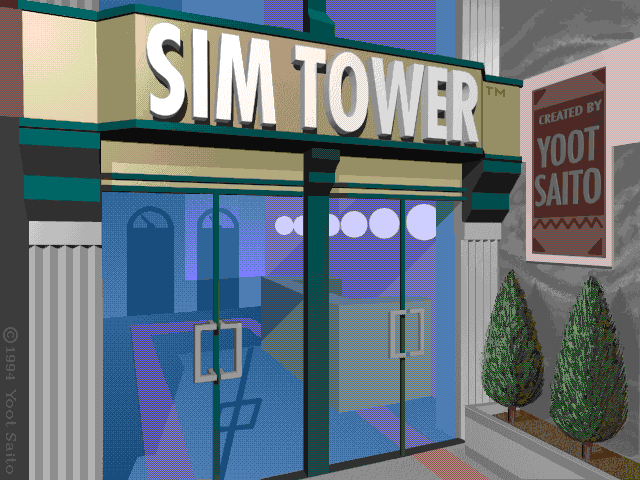 Where SimTower really excels is the slightly lower-key vibe of the game, something Maxis always did well but never mastered. 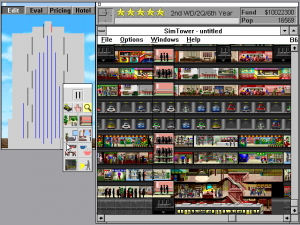 For comparison, SimCity is a macrolevel game, where supply and demand dictate the problems and regulations and taxes are key to managing the city’s smooth operations. 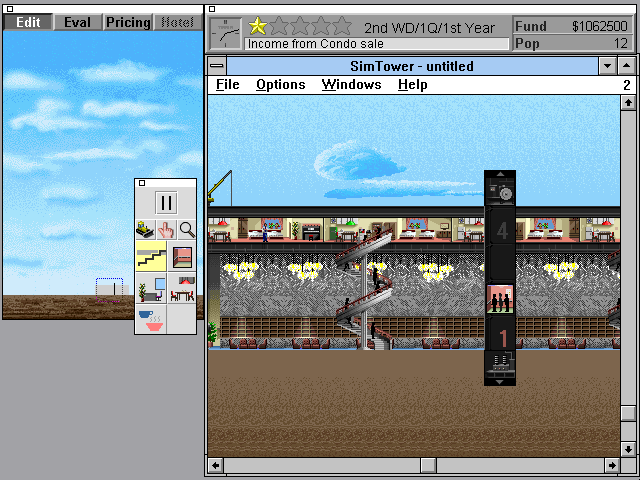 Saito conversely turned SimTower into an oddly personal, small-scale affair. Rather than large infrastructure problems or city management issues plaguing you, people might complain that their neighbors are too loud, that the elevators don’t run fast enough, or that their parking space is inconvenient. It’s not just that SimTower frames problems at a physically smaller level, but a more personal one. You can track individual people as they go to and from work, letting you observe their family life and commute. Once you’ve become a full-blown hotel, reviewers will stop by; you can follow them throughout their stay, seeing what services they use. After you put in service elevators for maids, you can observe how efficiently they work and whether they’d want additional transportation. Natural disasters are replaced by terrorist attacks, where the placement of individual security officers determines your building’s chance of survival. This is a dramatic change in tone from the typically broad, sweeping statistics that Sim games throw out. There’s no better expression of this than the feature that lets you name and color-code specific people. When they pack up and move out, it’s heartbreaking. Issues with the game’s difficulty only become clear deeper into the simulation. High-level strategy is daunting. 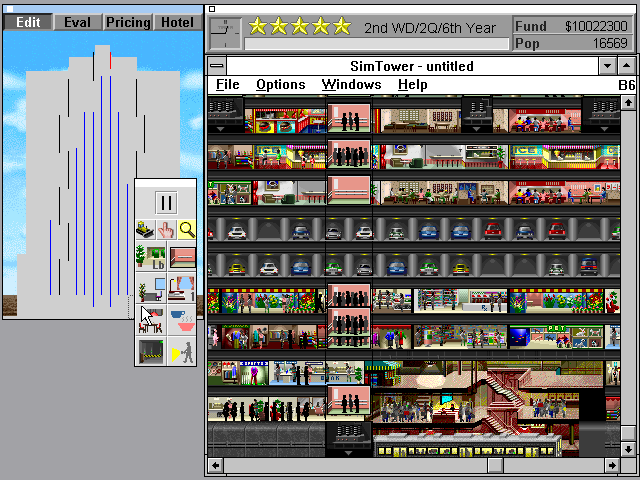 Creating a functioning five-star hotel takes immense pre-planning given the number of variables that can be thrown off towards the end; even so much as a misplaced elevator from the beginning of the game can eventually set you back thousands of dollars and disrupt your plans should your building expand in a slightly different direction. To correct this, you’d need to go through the readme’s several pages on elevator micromanagement. And when the time comes to add big-ticket items like movie theaters, unless you’ve strategically set off some space, neighbors will complain and move out, leaving your tower bare. Arguably many Sim games have some form of this dilemma, but SimTower‘s tightly meshed pieces allow less wiggle room. To this day, I have not completed SimTower, but Yoot Saito deserves some serious credit for crafting such an enjoyably personal game that’s fun even when impossible. My greatest obstacle to victory has been a lack of foresight, but that comes second to the joy of seeing individual people bring a building to life. The spiritual sequel Yoot Tower is basically a better version of this game. It would be interesting if you compared the two some time.